From the moment she met Page Parkes, whom she considers her "Fashion Godmother," Becky has utilized her love of fashion as a vehicle for philanthropy and hopes to inspire others through her path as a designer, while combining her passion to give back to the community. Our models were recently seen strutting down the "Fashion for a Passion" catwalk for Becky Hollands' S/S 2015 collection along with other Asian-American designers! 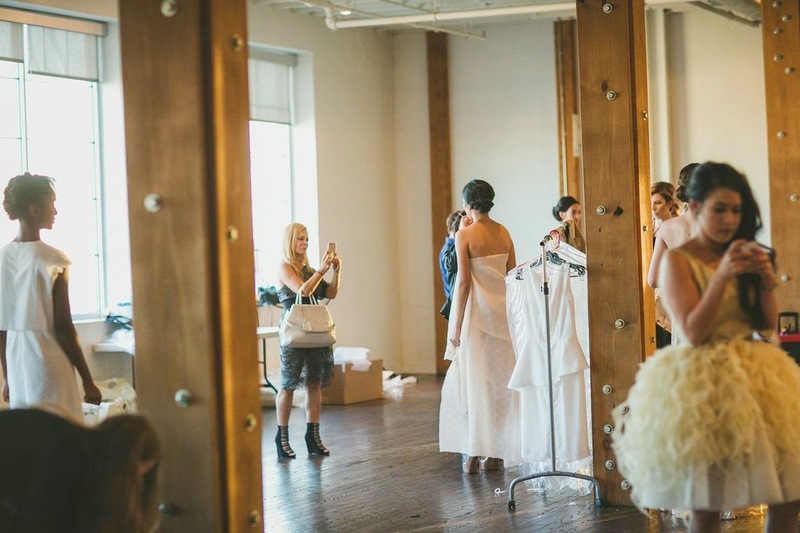 In Becky's collection, we were able to witness a modern printed full skirt, touches of luxurious ostrich feathers, and sophisticated draping. Whether your style leans towards classic little black dresses or more progressive silhouettes, Hollands' show includes something for any woman who has good taste and appreciates clean lines. Page Parkes (wearing custom made Becky Hollands Atelier) with two gowns auctioned off for donation! After the show, we were able to catch up with the busy, lady of the hour! We've come to learn about Becky's inspirations and how Page Parkes has helped mold a bit of her fashion career. 1. How did you meet Page Parkes and how has she helped you on your journey? Believe it or not, I met my Fashion Godmother, Page, on the airplane when I was a little girl and over a decade ago! Page had sat next to me on a flight back to Houston. I was talking about my wanting to be a fashion designer and majoring in Apparel Design and Manufacturing. Page took a liking to me and gave me her card and suggested that I work for her. Three months later, Jennifer, the Creative Director at the time called me back, and I worked for Page that summer. My experience was invaluable. I learned the importance of aesthetics and composition through photography and how important models are in the fashion world as they are the structure and base of presenting your clothing/product to its best potential. 2. When did you realize you wanted to become a designer? I’ve always loved fashion. As a little girl, I remember I always went to high tea and shopping with my mother after school in Hong Kong. I think my fascination of clothing developed then. 3. What inspired you to create this collection and how would you describe it? My work is often described as modern and timeless with a note of "effortlessness." This “modern sophisticate” evolves season to season. I also like to live vicariously through her. She was a “Diamond in the Rough” for the Spring/Summer 14 Collection and evolved into the “Jetsetter” for the Fall/Winter 2014 Collection. She is now “The Socialite” for the Spring/Summer 2015 collection. 4. What was it like debuting your collection in Dallas? Debuting my Spring/Summer 2015 “The Socialite” collection was amazing. I couldn’t wait to share my vision as a designer. I had the opportunity to dress my Fashion Godmother in Becky Hollands Atelier! She looked amazing. 5. Who are your designer inspirations and what is one fashion trend you love right now? My inspiration comes from my love of art, architecture, and my own bi-cultural upbringing. Growing up in a family with both Chinese and British parents, I learned the balance of expressing my ideas liberally yet in the most exquisite manner. I like to incorporate personal experiences and passions as inspirations for my designs. I am not a big fashion trend follower although I am aware of the current trends. 6. What can we look forward to next season already? Any sneak peeks? Currently, I am inspired by my students at Workshop Houston. Workshop Houston offers innovative youth development programs through our four shops: the Chopper Shop (welding and metal fabrication), the Beat Shop (music production), the Style Shop (fashion and graphic design) and the Scholar Shop (tutoring and academic enrichment). As Style Shop Coordinator, my goal is to inspire them to think about who they really are as individuals, how to express themselves, and developing their own style. Many of my students wear hijabs. Stay tuned to see how I may be incorporating it into my Fall/Winter 2015 Collection! Congratulations Becky on a phenomenal show and we appreciate your time in allowing our readers to get a glimpse of who you are! 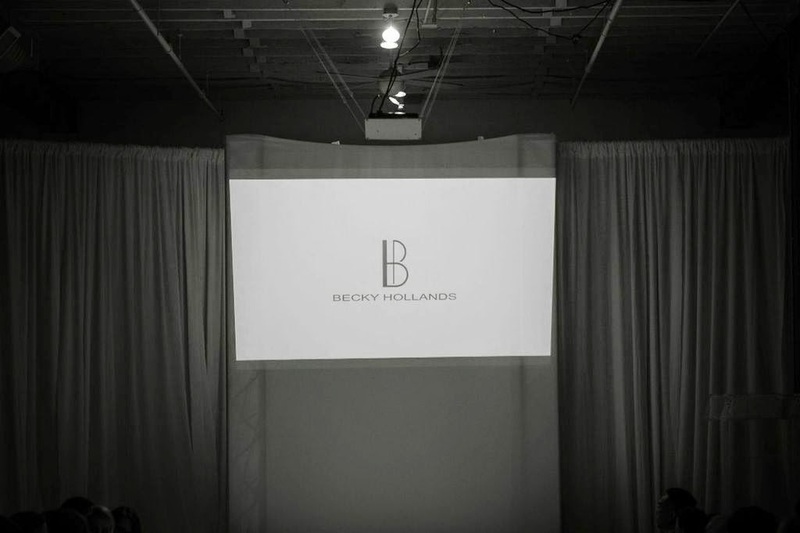 To see more information about Becky Hollands, visit her website here and follow her journey on Instagram (@bhollands)!